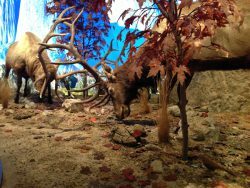 The Houston Museum of Natural Science has had Texas Wildlife diorama displays since the early days when the museum was located across the street at the zoo. In 2014 several of the older murals underwent a renovation of supporting habitat and species, and today these vintage treasures can be viewed in the basement of the Education wing. Today’s version of the Farish Hall of Texas Wildlife is located on the 2nd floor, and showcases the remarkably diverse biomes of our beloved Lone Star State. Dioramas highlighting Piney Woods, Oak Motte, Coastal Prairie and Wetland are included as nearby regions, whereas South Texas Dry Forest, Guadelupe Mountains, and High Plains are further afield in other parts of the state. There are also kiosks focusing on extinct and vanishing species, invasive species in our state, and aberrantly colored individual animals. In total over 425 specimens representing approximately 250 species will be on display. Emphasis for this exhibit is placed on rare, endangered and extinct species. Over 50 species, more than 20% of those on display, are classified under some level of threat. One of the most important services a museum provides to its patrons is serving as a monument of history. For this reason, the dioramas emphasize what our state’s wildlife looked like prior to extensive human colonization. Species such as White-tailed deer, Pronghorn, Bald Eagle, Peregrine Falcon, Alligators, and various Egrets and Herons were all but extinct at one point in our state, but today are present in stable numbers. Ocelots, Jaguarundi, Whooping Cranes, and Red-cockaded Woodpecker are still teetering on the brink of extinction in Texas despite populations being more stable today than they used to be. Black Bears, although formerly widespread, remain locally extinct throughout much of the state. Elk, Bison, Desert Bighorn Sheep, Aplomado Falcon and Attwater’s Prairie Chicken were actually completely extinct in our state at one point, but were replenished through translocating other populations in the case of the Elk and Sheep, or releasing captive-bred birds in the case of the Bison, Falcon and Prairie Chicken. Although zoo-bred Black-footed Ferrets have not yet been reintroduced to our state, it has happened elsewhere and could occur in the future in our Texas. Sadly for others, such as Jaguar, Passenger Pigeon, Ivory-billed Woodpecker and Carolina Parakeet it is too late. Jaguars are totally absent from Texas, unlikely to return here ever, and the Pigeon, Woodpecker and Parakeet are globally extinct – gone forever. Curator Daniel Brooks, Ph.D. has been curator of vertebrate zoology at HMNS since 1999. When not creating new exhibits, among other capacities, he is coordinating two long-term Texas bird research projects: one dealing with invasive species, and the other with waterfowl community structure. Tour the new hall with Dan and museum master docents. Curator: Daniel M. Brooks, Ph.D.
Dr. Dan Brooks joined the Museum staff full-time in 1999. Education Current Service Credentials / Honors Current Research Projects / Interests Lab Associates Students Publications What collections you are responsible for? Why did you decide to work in a Museum? What is your favorite specimen, and why? Is it on…. Please help us to preserve our collections for the next generation by not using flash when taking personal pictures at HMNS and at HMNS Sugar Land. Exposure to strong lights over time causes fading and deterioration of most artifacts and specimens. Flash photography is ONLY allowed in the Grand Hall and the rainforest of the Cockrell Butterfly Center. Selfie sticks are not allowed anywhere in HMNS, HMNS Sugar Land and the George Observatory. For press and any commercial photo shoots, please contact the Public Relations dept.